The minute we sold our first commissioned piece, we had a vision & were thrilled when our buyer, Erin was all in. She purchased this darling child sized table & chair set for her sweet daughter Rose but wanted to bring a little color into the plan. 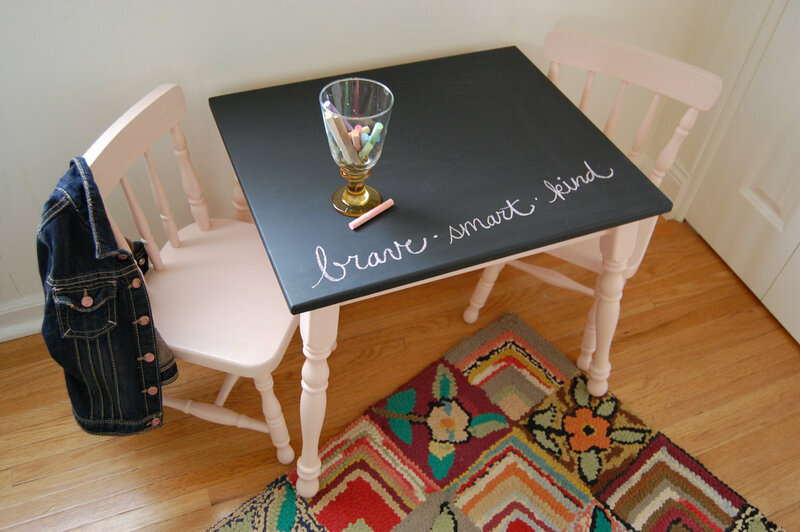 When we suggested to combine of the shade of her choice with a chalkboard top, Erin thought it would be perfect. We think we hit the mark on this one. 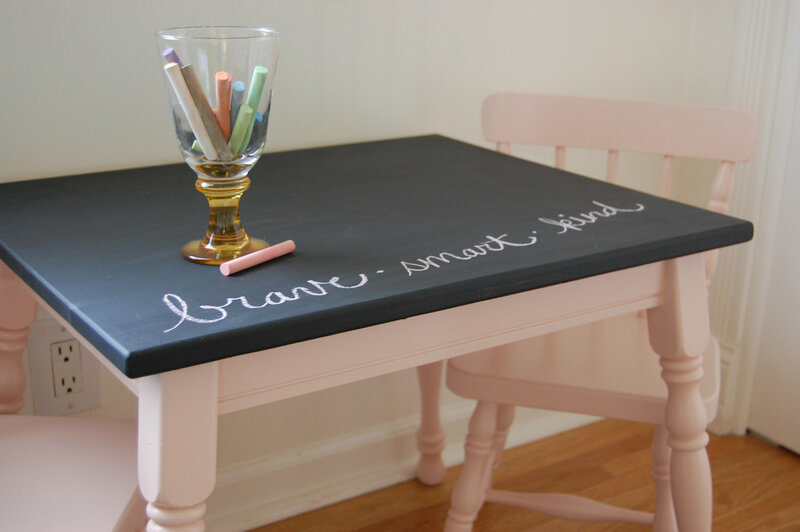 The soft pink adds such a girly touch and the endless fun to be had on the chalkboard top is just plain smart. Bring on the play dates! OMG, I love your before and after pictures. I have a six people dining set that looks exactly like this, same colour same pattern on the chair and table legs. I was thinking of painting the entire set white but have been procastinating. Can I ask you how many coatings did you use? How long did it take you to do this? I am seriously thinking of starting this project this summer. Hello Casey & great question. If you are planning on doing white, depending on the original color of the wood, you will most likely have to do 3 coats to get your best finish. Make sure to allow enough dry time between each or the paint will get gummy. The difficult part is the spindles. Spindles, to be painted well (in our humble opinion) need to be painted around the legs. Additionally, make sure you use the right finish of paint. 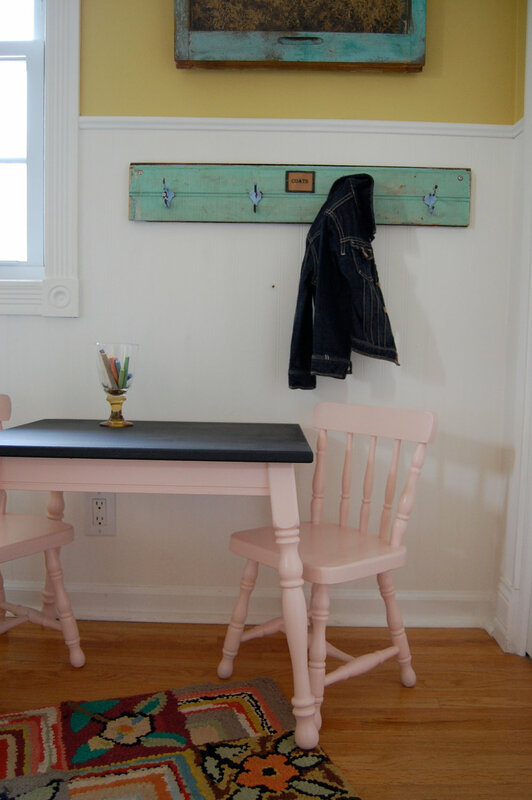 For a table that is getting used quite a bit, make sure you use Satin or Glossy finish. Anything in the matte family of finishes will be difficult to clean and wipe down. Thanks for the fine compliments. Our customers are our best critics.